Suriyasak, the leader of the United Front of Democracy against Dictatorship (UDD) in Surin and 8 others were arrested and accused of being part of Koti Network. Suriyasak was accused of terrorism in the protest in 2010, and of allegations of violating Article 112 Criminal Code in his messages sent through Line Application. The 8 others were accused of weapons possession and terrorism. Per the arrest record, it was reported that, on 13 July 2016, Suriyasak sent a message through the Line application to his Line group members in line group named “Kon nok kala”. The name of his Line account ID was “Suriyasak” and his account ID displayed his picture in his account profile. The message contained content which attacked the monarchy institution. His action was alleged to violate Article 112 Criminal Code and Article 14(3) of the Computer Crime Act. His alleged offense had been committed before the declaration of the NCPO’s Order No. 55/2016 which is about abrogation of prosecuting civilians in military courts. Thai Lawyers for Human Rights (TLHR) reported that, on 18 March 2017, at around 6 am a witness who observed the incident said that two vans, one police car and two Fortuner cars were driven to the street where Suriyasak’s house is located. After that, more than 10 military officers from multiple divisions in Bangkok and Surin (armed with rifles) and at least 5 police officers arrested Suriyask at his house and took him away from his house. On 19 March 2017, a friend of Suriyasak went to the 11th Military Circle in order to visit him but the friend’s request to visit him was denied. However, a military officer confirmed that Suriyasak was detained in the 11th Military Circle and will be detained for 7 days. Manager Online reported that the arrest of Suriyasak is one part of the 9-points search operation which was aimed to destroy a network of Koti or “Wuttipong Kotchathammakun", one of UDD members who refuge to another country who now possess war weapons. At least 9 persons were arrested in this search operation and Suriyasak is one of them. Suriyasak was arrested at his house in Surin and was taken to the 11th Military Circle in Bangkok. Thairat Online reported that Pol. Gen. Jaktip Chaijinda, Royal Thai Police Commissioner-General, Pol. Gen. Sriwara Rangsibramnakul, Royal Thai Police Deputy Commissioner-General and Pol. Col. Paisit Wongmuang DSI Director-General together announced the result of the search operation on 9-points from 7 provinces including Pathumthani, Ang Thong, Nongkai, Surin, Nakornratchasrima, Prachuap kiri khan and Samutprakarn. According to the search, they seized 13 guns of several types, 5,949 bullets, some components of guns, 7 types of gun parts, 8 artificial guns, 393 Amphetamines, red canvas labels and many documents about politics. There were 9 suspects including police, soldiers and civilians. The suspects were detained. At around 10.40 am at the Crime Suppression Division, Maj. Gen. Vijarn Jodtaeng, the leader of legal department of the NCPO and Col. Burin Thongprapai, the military’s Judge Advocate General’s Department of the NCPO escorted the accused indivuduals to meet inquiry officers. After that, they held a press conference and showed seized evidences to the press. The 9 accused including Theerachai or Rapin, 55 years old, Pratuang, 58 years old, Palida, 62 years old, Bunsong, 54 years old, SM1 Thanachot, 57 years old, Acting Sub Lt. Suriyasak, 49 years old, Em aon, 44 years old, Wanchaichana Krutchaiyan, 56 years old and Udomchai or Saenrak, 60 years old. At the Crime Suppression Division, before the press conference, the accused individuals were taken to be photographed. After that, they met the doctor for a physical examination to make sure that they were not tortured during detention. The officers also contacted lawyers from Lawyer Council of Thailand to meet the accused in the same day. During the publication, Pol. Maj. Gen. Chayapol Chatchaidej read name list of the accused per the warrants. All of the accused individuals received arrest warrants for criminal association according to Article 209 of the Criminal Code since they had meetings together. Some of them were alleged to possessing weapons and drugs, while only Suriyasak was alleged for article 112. Suriyasak expressed his opinion during the press conference that he denies his involvement with possession of weapons because it is against the principle of the UDD organization. This is because the UDD believes in pacifism. Meanwhile, Pol.Gen. Sriwara Rangsibramnakul, Royal Thai Police Deputy Commissioner-General who was a chairman in press confernce told everyone that Suriyasak did not receive any warrant for allegations relating to weapons at first, so there is no need for him to reject this allegation. After the publication was finished at the Crime Suppression Division at around 12 o’clock, the accused individuals were escorted to the DSI office to be inform the allegations and for interrogate as the DSI must be responsible for the case relating to Koti Network. In the evening, the DSI announced terrorism allegations for the 9 accused according to the redshirt protest in 2010. Many of the accused individuals were further accused of possession of weapons. Even if Suriyasak was not accused of possession of weapons, but Pol. Lt.Col. Sanpetch Noothong, the inquiry officer from the Crime Suppression Division, arrived at the DSI office to inform the allegation on violating Article 112 to Suriyasak per his action of sending the message to the Line group. After the announcement, Suriyasak and all accused rejected all allegations and were detained in a detention room in the DSI office. At around 9 am, all the accused individuals were escorted to Criminal Court for a provisional detention . The inquiry officers from the DSI submitted a request for detaining the accused individuals for 12 days. Circumstance per the request for detention stated that the police officers and security department found that a group of people in Koti Network were planning to accumulate weapons, war weapons and bombs for terrorism. Thus, they surrounded and search at Dharmmakaya temple and also search people’s house from 9 points in 7 provinces . They discovered many weapons. Some weapons belongs to the army which were stolen during the redshirt protest in 2010. They also found many documents about the establishment of a force which point that the 9 accused were in Koti Network who accumulated weapons for terrorism in 2010. All the 9 accused were then accused of terrorism charges per Article 135/1, 135/2 of the Criminal Code. After submitting the request, the court allowed the detention. The relatives of some of the accused individuals submitted a request for bail with 300,000 THB as security. However, the court did not approve the bail because the allegation carries a severe penalty including death penalty. The circumstance of the case was about an organization that lead to violence and disturbance in the country, and the inquiry officer opposed the bail request due to fear that the accused individuals will flee the country and commit crimes of a similar nature. Suriyasak did not submit the request for bail because he predicted that the court will deny his request and even if his bail is approved for this case, he will be detained in military court for violating Article 112. 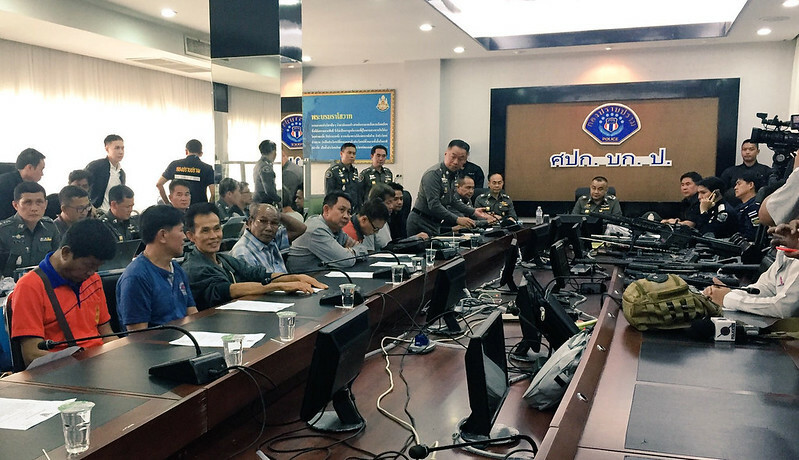 Suriyasak and the other accused individuals were detained. The accused individuals of male gender were detained in Bangkok Remand Prison while the accused individuals of female gender were detained in Central Woman Correctional Institution. The detentions have been condcuted during the inquiry process under terrorism charge. The prosecutor issued a non-prosecution order to 9 accused of weapons possession and terrorism. All accused were released from prison but the inquiry officials from Technology Crime Suppression Division(TCSD) arrested Suriyasak under the charge of Section 112. Suriyasak was taken to Thung Sing Hong police station and detained there for 2 nights before was taken back to be detained at Bangkok Remand Prison.